Sometimes it’s the wealth of experience that sets a business apart from the rest, and sometimes it’s the people that make a company really shine. At Earthtones Landscape Management, it’s a little bit of both. With over 20 years of experience as a premier Phoenix landscaping company, we’re committed to providing our commercial and residential landscaping clients with a level of service and affordable rates that other Phoenix landscaping companies just can’t offer. It’s often said that quality work, friendly employees and a job well done are hard things to come by, but at Earthtones Landscape Management, those things are our top priority. Whether you’re a commercial or residential client, big job or small, we’ll care for your property like it was our own and leave you with a finished product that you’ll be happy to call your own. It’s that philosophy that drove our founders, brothers Steve and Doug Sweeny, to start Earthtones Landscape Management over 20 years ago. The brothers Sweeney were born in Redondo Beach, California during the 1970s, where they enjoyed the surf, sand, temperate climate and active lifestyle encouraged by their parents. As the boys grew into young adults, they joined their father during the summers to work at the family business: landscaping. It was in those early days that the brothers Sweeney began to set the groundwork of what would one day become Earthtones Landscape Management. As they learned the business from their father the boys found that they gravitated towards different areas of the business: Steve loved the business side, while Doug became passionate about the art of landscape design. 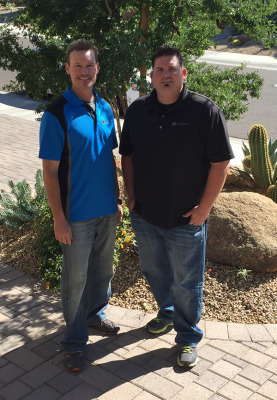 After many years of working with their father, the brothers eventually decided to come together and start their own landscaping company in Phoenix, Arizona: Earthtones Landscape Management. With hard work, determination and the ability to outperform and out-price their competitors, Earthtones Landscape Management quickly became one of the area’s fastest growing landscape companies. That growth continues today as Earthtones expands its territory and the landscaping services offered to Valley residents. Earthtones Landscape Management is a full-service commercial and residential landscaping company in Phoenix, Arizona. We offer a wide variety of unique landscaping solutions and custom designs, and we also offer services like landscape maintenance, one-time/weekly/monthly property cleanups, tree trimming and tree thinning, hardscape services, firepits, gardens, landscape installation and so much more. If you have a custom project in mind or simply want your property maintained, we’re the crew for the job. For more information on what Earthtones Landscape Management can do for you, simply contact us and we’ll get to work planning the perfect landscape solution for you. Be sure to ask about our affordable special offers and other services. The Sweeney brothers and their talented team are excited to help you turn your property into a place you and your family can enjoy for years to come. Our customers often tell us we exceed their expectations. Whether you need a custom landscape design, installation, weekly maintenance, clean-ups, or tree services, call Steve at 602-796-0606 or contact us by e-mail and let’s talk about it.